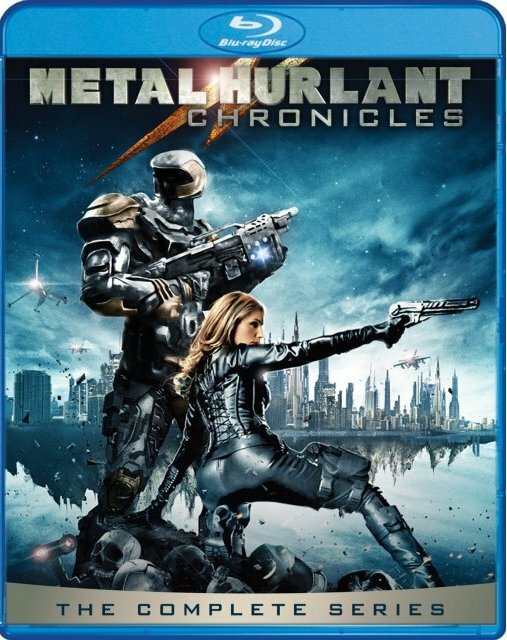 Schlock-Wire: Shout Factory Gets Heavy In April With METAL HURLANT CHRONICLES: THE COMPLETE SERIES On Blu-Ray And DVD – Schlockmania! This spring, let your imagination run free. Sci-fi fantasy and comic book fans will have the chance to embark on a unique journey beyond space, time and known worlds that await us when the highly celebrated live-action, sci-fi anthology METAL HURLANT CHRONICLES: THE COMPLETE SERIES debuts for the first time on Blu-ray™ and DVD on April 14, 2015 from Shout! Factory. Visionary writer-director Guillaume Lubrano brings his faithful, well-crafted adaption of the world renowned comics anthology Métal Hurlant (also known internationally as ‘Heavy Metal’ Magazine) to live-action with a star-studded cast including Rutger Hauer (Blade Runner), Scott Adkins (Expendables 2) Michael Biehn (Aliens), Kelly Brook (Piranha 3D), David Belle (Prince of Persia), John Rhys-Davies (Raiders of the Lost Ark), Joe Flanigan (Stargate: Atlantis), James Marsters (Buffy The Vampire Slayer), Dominique Pinon (Alien: Resurrection), Michelle Ryan (Doctor Who) and Michael Jai White (Spawn). The last fragment of a living planet, reduced to dust by the destructive madness of its habitants, is condemned to roam the universe for eternity, bringing suffering and deception to those who cross her path. That damned messenger is called: The Metal Hurlant. From 1960s cold war drama to distant future, fantasy to medieval, the live action sci-fi series METAL HURLANT CHRONICLES spans a wide range of self-contained stories linked together by an asteroid, called the METAL HURLANT, which passes close to the planet where each story is taking place, thereby changing the outcome.